Saturday’s are hard for me. I work Friday’s 4am-2:30pm, getting up to pump at 1:45 to start my day. The commute to/from work is nearly an hour, so I get home around 3:30pm to a house full of boys. Since I am still breastfeeding the 7 month, old I usually have to sit down with him shortly after I arrive home. I don’t get much done on a Friday after work, but I almost never get to nap. Yesterday was no exception. It wasn’t overly strenuous, but after putting away my work gear, fixing myself a large iced coffee, and nursing the baby we went out to the golf course next to our property. I had the baby in a front carrier, so I didn’t play, I just walked the course with the boys. (Hubby, 11 year old, and 2 1/2 year old) We were out just over an hour, then we came in and fixed a nice easy dinner. Chicken ravioli with broccoli in alfredo sauce, with some garlic toast. 🙂 We watched a movie as a family, then played some mad libs. It was 11:30pm by the time I was settled in bed. I really hoped the baby would cooperate and give me some rest. He didn’t wake up until almost 4am, so I got a decent amount of sleep. 😉 Hubby was up getting ready for work, and about to leave. I brought Jacob to bed with me to nurse, and kept him with me nursing him every couple of hours until about 8am. Since I have been trying to stick to my meal plan, I knew tonight’s dinner was scheduled to be chicken tacos. I got dinner in the crock pot just after 9am, and now I know I don’t have to worry about anything until dinner time tonight. I put mild salsa in my crock pot to cover the bottom, sprinkle on a generous amount of taco seasoning, place frozen boneless/skinless chicken breast on top of the salsa/seasoning then add more salsa on top of the chicken. That’s it! I will let it cook on low for several hours, and then shred the chicken before dinner. 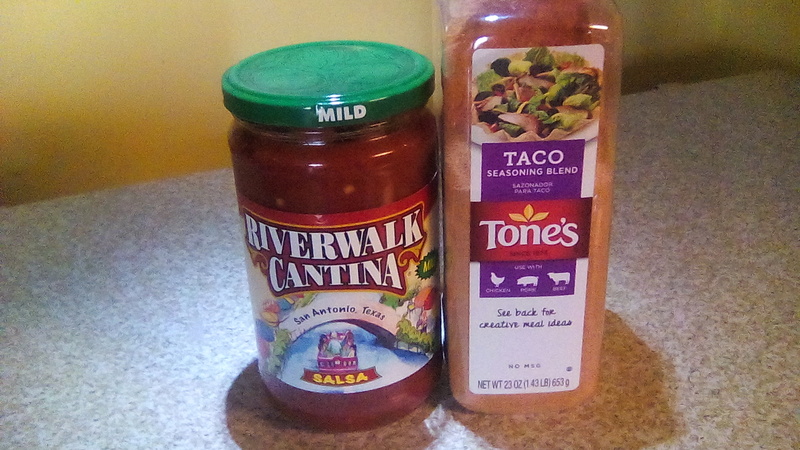 Tonight we are having soft tacos, so we will just put some of the chicken and salsa mixture on a soft tortilla and add lettuce, cheese and sour cream to our liking. This is after cooking for about 3 1/2 hours. 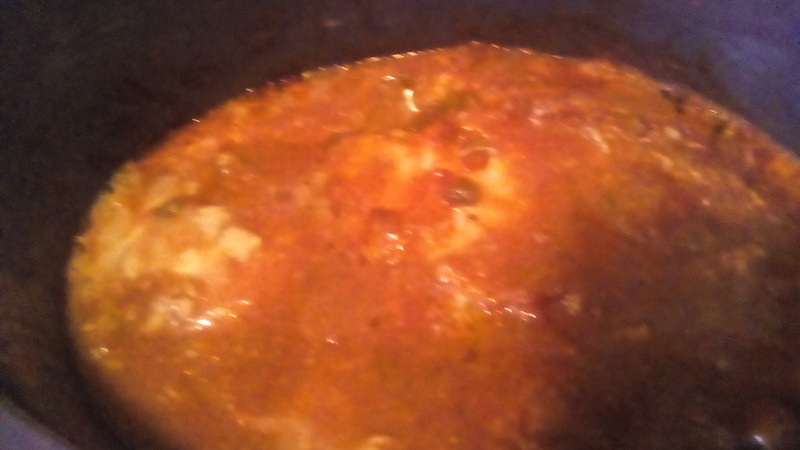 The chicken creates a lot of liquid as it thaws and cooks. I know I shouldn’t open the lid, but I can’t help giving it a bit of a stir. If it’s too moist at dinner time, we can just use a slotted spoon to serve. Once the chicken is shredded I’m sure it will seem thicker.